Rae Landy as a young woman. Photo courtesy of Diane Rosenblum. From 1913 to 1915, Landy, along with fellow nurse Rose Kaplan, lived in Jerusalem among the bustle, the poverty, the burgeoning Zionism and the outbreak of World War I, all the while administering to the sick and sending regular reports of her life and work back to Henrietta Szold in New York. Members of Hadassah—which had just been founded in 1912—were kept informed of the nurses’ activities through the organization’s bulletin, which years later evolved into the very magazine you are reading. Perkul’s research into her aunt’s career elicited a deeper understanding of the power of nursing. 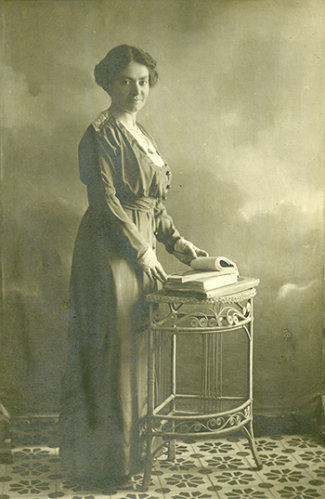 “She was like many women in nursing at that time,” writes Perkul, “who viewed their profession as a calling and dedicated all their energy to a higher mission, channeling their passion into their careers.” One might add that in the case of Landy, her work on behalf of Hadassah represented her best self in her commitment to patient care as well as Zionism, which she ardently supported. To learn more about Winds Over Jerusalem and its author, visit debbiperkul.com. Impressive: must have taken tedious (and comprehensive) research! Are there more such, about other historical figures, in Debbie Perkul’s future?